"We dearly love my brother Simon and we still hold hope that he will come home safe and well one day soon." Keep on hoping I will bump into you in the street, or coming online and seeing a big SOLVED stamped across your head. Simon James Brazier, 33, of Secret Harbour, WA. Last seen: March 31, 2005. Circumstances: Vanished after missing an appointment with his GP. Police are asking the public for help in locating a missing man from Secret Harbour, WA. Simon James BRAZIER 33 years of age has been reported missing by his father on Saturday 16th April 2005. He was last seen on or about 31st March 2005 at his home address in Secret Harbour. He was possibly in possession of a large backpack and hiking boots which are missing from his home. Family and Police are concerned for Simon's welfare due to the length of time that there has been no contact with the family. Simon Brazier is described as Caucasian, 182cms in height of stocky build with tanned complexion, brown hair, hazel eyes. It is not known what he was wearing at the time of his disappearance. If anyone has any information as to Simon's whereabouts please contact Crime Stoppers on 1800 333 000. Police and family are concerned for the welfare and safety of Simon James Brazier (aged 33). Simon was last seen on or about the 31st of March at his home address in Secret Harbour, possibly in possession of a large backpack and hiking boots. Police think that Simon may have gone for a walk on the Bibbulmun Track. Caucasian male, 182cm tall, dark brown hair, hazel eyes, tanned complexion and a stocky build. Any information concerning the above information to be forwarded to Senior Constable Wilson-Cross or Smith Missing Person Investigation Unit on 9223 3662 or Crimestoppers 1800 333 000. A MISSING man's wallet has turned up in the letter box of his last known home - more than five years after he disappeared. Police today called for the person who this week delivered Simon Brazier's wallet to his Secret Harbour home to contact them, in the hope they can shed light on his whereabouts. 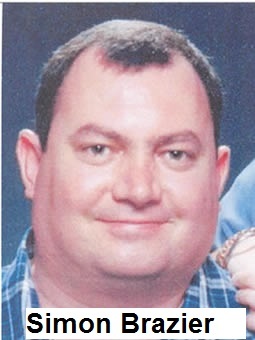 Mr Brazier, who would now be 38, has been missing since April 2005 when he left his Queensland home after telling family he was returning to Perth, where he had lived previously. It was the last time they saw him. But on Monday, Mr Brazier's wallet, which has not been seen since his disappearance, was found by a family member in the letterbox of his Sete Green property. The wallet, which was weathered, contained bank cards, health cards and a drivers licence, all of which had expired. There was no cash in the wallet. First Class Constable Lucy Greatorex, from the Missing Persons Unit, said police wanted to speak to the person who returned the wallet in a bid to locate Mr Brazier. Police did not believe the find to be sinister in nature, Constable Greatorex said. ``We just want those people who have been honest enough to drop it off and return it to the rightful owner to come forward and perhaps assist us with our inquiries,'' she said. She said police believed the person may have driven a dark green stationwagon, which was seen in the vicinity at the time. Mr Brazier served in the Australian Navy for six years and lived in WA before moving to Queensland to be closer to family and friends. In 2005, he returned to WA, where he owned a property in Secret Harbour, south of Rockingham, but disappeared soon after. Mr Brazier contacted his parents by telephone and made a doctor's appointment shortly after, which he failed to keep. A backpack and hiking boots are believed to be missing from his home. Anyone with information about Mr Brazier's whereabouts is urged to call Crime Stoppers on 1800 333 000. POLICE have spoken to a couple who found and returned missing man Simon Brazier's wallet to his former home - five years after he disappeared. They placed the wallet in the letterbox where it was found by Mr Brazier's family. Police Missing Persons Unit thanked the couple for coming forward and identifying themselves as the finders of the wallet. The couple have told investigators that the wallet was found on a beach and they will continue to assist with the missing person investigation. Yesterday police revealed Mr Brazier's wallet had turned up in the letter box of his last known home - more than five years after he disappeared. Sergeant Greg Lambert of Police Media said the people who returned Mr Brazier's wallet have spoken to police. "We have had someone come forward to provide some significant information with regards to that wallet. Police yesterday called for the person who this week delivered Mr Brazier's wallet to his Secret Harbour home to contact them, in the hope they can shed light on his whereabouts.